Of Owen Sound, (formerly of Sauble Beach), passed away at Grey Bruce Regional Health Centre (Owen Sound) on Sunday, March 8, 2015. Jean Alice Melinda Goodwin (nee Schaefer) at the age of 83 years. 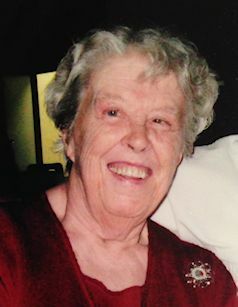 Beloved wife of the late Donald Goodwin (Dec 2014). Dear mother of Carol (Gerry) of Winnipeg; son Don Jr. (Karen) of Calgary; grandchildren Matt (Lindsay) of London UK; Tyler (Haley) of Calgary; Ivy (Josh) of Calgary; great-grandchildren Ava and Charlie of London UK; sister Enorma (Buddy) Kingston; sisters and brother in-law Doris, Janet and Jack; and numerous nieces and nephews, great-nieces and great-nephews. The family thanks the cheerful and kind staff of ward "6-2" ; the patient staff of Golden Dawn and Summit Place Nursing Homes where Jean had lived since May; and the many neighbours, friends and family members who helped Jean out, especially during this past challenging year. Special thanks to Jeff and Jennifer Moser who gave generously of their time and energy to support "Auntie Jean" in many ways. Jean was an ardent nature and animal lover all her life. Please consider making a donation to your local Humane Society, animal shelter or Conservation group as an expression of sympathy. Friends are invited to join with family to celebrate the life of Jean at the Thomas C. Whitcroft Funeral Home & Chapel, 814 Bruce Rd. 8, Sauble Beach (519) 422-0041 on Tuesday May 12, 2015 at 1 o’clock. Visiting one hour prior to service. The service will be followed by a luncheon. Thence to Zion Cemetery, Hepworth, where Jean and her husband of 64 years, Don (December 21, 2014) will be interred in a shared committal service.